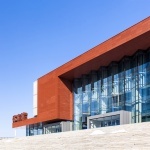 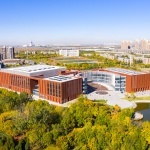 The Gymnasium in Tianjin University of Science and Technology is a new gym built in the university under the call of the 13th National Games. 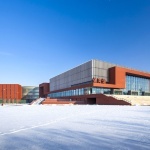 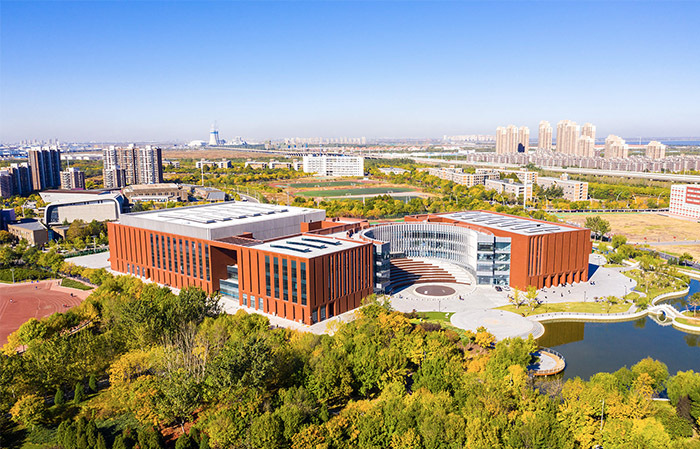 Located in the southwest of Tianjin University of Science and Technology, about 58 kilometers from the National Games Athletes Village, the project consists of three functional units: the main gymnasium, the secondary gymnasium and the stormproof playground. 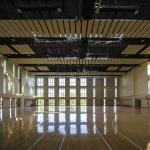 Among them, the main gymnasium is positioned as a grade A one, with the conditions to hold international single indoor and national comprehensive sports events, and also serves the school and surrounding communities to meet various functions such as training, teaching, assembly, and theatrical performances. 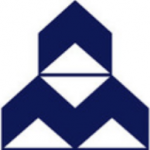 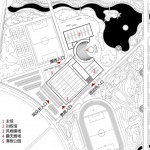 The design of the project clarifies the goals to guarantee the use of National Games and the daily use of the university after the Game, so that the design meets the professional and high standards of the National Games, and meets the multi-functional and easy-to-maintain needs of the university for long-term use. 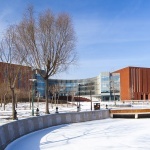 The design subtly introduces a circular open space at the intersection of the multi-axis of the center of the site, successfully handles the relationship between the space and the landscape axis in multiple directions in the site, and flexibly integrates the architectural form, the function of use and the landscape of campus. 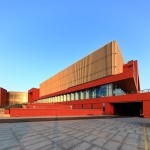 It brings a sleek and dynamic atmosphere to the rigid gymnasium, so that the general layout is organic under the premise of its rationality and harmony. 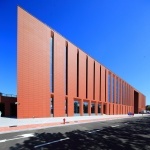 The amphitheatre offers a venue for a variety of outdoor activities, with a three-storey leisure round corridor that connects the main gymnasium, the secondary gymnasium, and the stormproof playground connect to it. 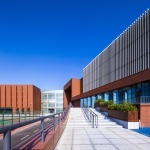 When there are activities, the corridor can become an extended part of the theater, and become a shared service center, providing leisure functions such as water bar, bodybuilding ,reading, and communication, which greatly enriches the functional connotation of the gymnasium. 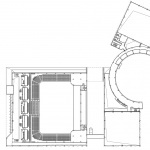 The units of the gymnasium are fan-shaped around this circular open space, and follows the road and boundary of the campus to generate a simple, rational and practical cube , which constitutes the general layout form with a circle inside and squares outside. 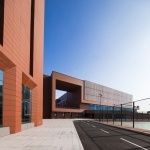 The gymnasium has a corresponding design strategy for the specific use of the school in the functional mode. 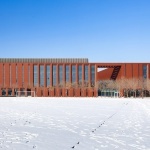 The main gymnasium adopts an asymmetric design with fixed seats and active seats of three sides and all active seats of the fourth side. 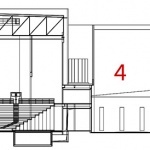 An electric lifting stage is arranged under the seats of the fourth side, which can be converted among the stands, the stage, the rostrum and the training ground. 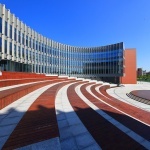 The arrangement of the audience seats not only enables the gymnasium to meet the requirements of various formal competitions but also can be transformed into a large auditorium for various gatherings and cultural performances, which can accommodate all students in one grade to attend the ceremony. 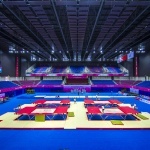 The main gymnasium has 4,980 seats in total, of which 37% are active seats, making the arrangement of the seats fully flexible. 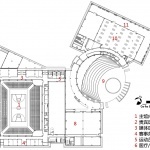 At the same time, the affiliated rooms of competition also adopt a universal and flexible design, which can greatly improve the utilization rate of the venues by converting into activity rooms for students after the competitions. 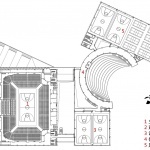 The secondary gymnasium is located between the main gymnasium and the stormproof playground ,which is directly connected with the athletes’ area of the main gymnasium. 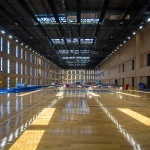 It forms a complete grade A gymnasium function with the main gymnasium during the Games, while forms a student sports and activity center with the stormproof playground and the leisure round corridor in normal time, which means the gymnasium could be flexibly switched between competition mode and normal mode. 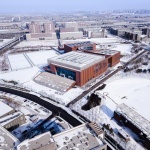 The simple and square shape of the Tianjin University of Science and Technology conveys the simple and elegant concept that college education aspires to express. 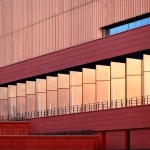 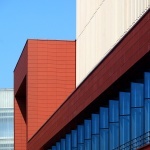 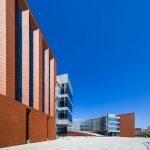 The facade is composed of a series of terracotta panels, concrete louvers, and organ-shaped reflection glass curtainwalls, creating rhythmic vertical lines and rich variations with light and shadow. 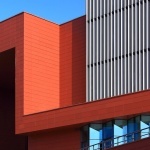 While dissolving the huge volume of the stadium, the economic, durable and easy-to-clean materials meet the requirements of high-intensity and easy-maintenance of the university. 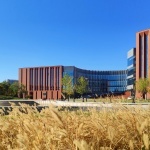 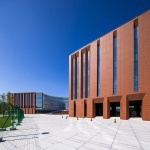 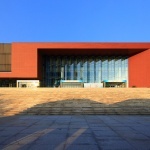 After the test of being the venues of the rhythmic gymnastics and trampoline project in the 13th National Games, as well as the school’s use in recent years, the Tianjin University of Science and Technology Gymnasium has won praises from all parties, and has become the vibrant campus center of the school.